Building digital capabilities in investment management has been added to your bookmarks. Building digital capabilities in investment management has been removed from your bookmarks. The investment management (IM) industry has been going through digital disruption for some time now. Investors from across generations and wealth segments prefer digital service channels ranging from online wealth management and investment tools to robo-advisers. Forming a coherent digital business strategy is likely to drive success for IM firms in 2018 and beyond, as customers’ preference for digital service channels is a key contributing factor to the IM marketplace shift. IM firms with agile and efficient operating models that can create differentiated investor experiences may generate outpaced asset growth. This said, some additional firms have fought the odds and are offering services through digital platforms. For example, Putnam Investments’ FundVisualizer tool enables advisers, brokers, and other intermediaries to analyze and compare mutual funds, exchange-traded funds, and indices using multiple performance and risk metrics. The tool allows advisers to create and model portfolios, compare correlations, and generate customized reports for their clients.4 Such digital models may enable IM firms to deliver a seamless digital experience to the current and future investors. It goes without saying that IM firms have to be prepared to serve the future investors. Within a generation, millennials will likely be an important segment for many IM firms. Their wealth is expected to grow to $15 trillion in the United States and $12 trillion in Europe over the next 15–20 years.5 Targeting these customers could demand a digital quantum leap to meet their expectations, as they prefer more digital trust and online relationships compared with earlier generations. Furthermore, digitally advanced IM firms could be better positioned to manage through margin pressure with their improved efficiency as they shift to target millennials. In order to implement the strategy, business leaders should transform initial small experiments into enterprisewide digitization efforts. The digital transformation strategy of many IM firms will call for internal training and recruiting, and partnership with a fintech firm to develop a dynamic and multifaceted platform that enables digital delivery of all services. 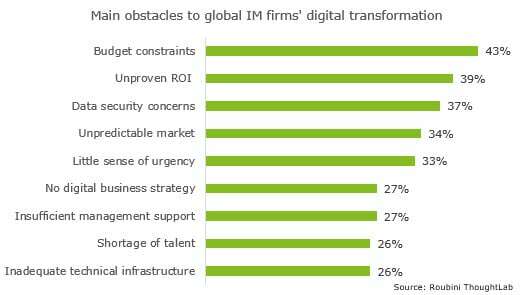 It is likely that many successful IM firms will begin to implement or strategize a digital business model in 2018 to prepare them for a changing future. Has your firm commenced its digital journey yet? 1 YinYin Yu, Cynthia A. Pagliaro, Stephen P. Utkus, “The Digital Investor - Patterns in digital adoption,” Vanguard, July 2017. 2 G.C. Kane, D. Palmer, A.N. Phillips, D. Kiron, and N. Buckley, “Achieving Digital Maturity” MIT Sloan Management Review and Deloitte Insights, July 2017. 3 “Wealth and Asset Management 2022: The Path to Digital Leadership,” Roubini ThoughtLab, 2017. 4 Putnam Investments’ website, accessed on January 11, 2018. 6 G.C. Kane, D. Palmer, A.N. Phillips, D. Kiron, and N. Buckley, “Achieving Digital Maturity” MIT Sloan Management Review and Deloitte Insights, July 2017. 7 Jesse Bonanno and Jared Goldstein, “Ahead of the curve,” Deloitte, 2018. Dawn of a new day for investment management?